Looks unassuming from the outside. entertainment and hang out for a while. For some reason, this feels more adventurous than doing the same thing in my hotel room and I’m not sure why. 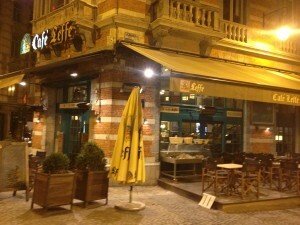 I locate a likely looking candiate, Cafe Leffe which is a short walk from my apartment. Leffe is a very very common Belgian ale. It’s the type of beer that you can find in cans and bottle 12 packs at the local grocers. It is also delicious. When I get into the place, I realize I have misjudged it. Instead of a rough hewn table in the corner of a dark bar, I find myself sitting at a table with a white tablecloth surrounded by wealthy tourists. I quietly lament the 3DS in my bag that can’t come out and play, but I resolve to enjoy my time there anyway. The meals were around 18-23 euros, which is about 24 USD. I’m already committed so I might as well enjoy myself. I order the duck with apple brandy sauce. While I wait, my waitress slices up some bread at the baguette station located right next to my table. The bread is something else. An extremely fresh slice of frech Belgian bread is exquisite. I ended up using it to mop up any spare apple brandy sauce that came on my duck. While the duck was fine, the sauce it was set in stole the show. I furtively hid all my uneaten bread in my purse for later. I ended up burning it in my toaster oven the following morning, which left me rather depressed. 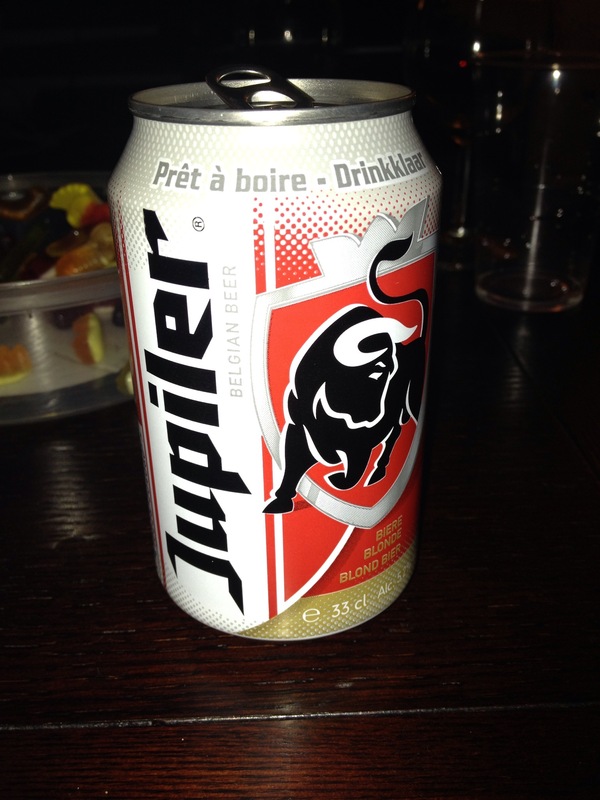 Jupiler, the Belgian Bud Light. On Saturday night, I went out to a party at the house of a friend of a friend. It was a party/private concert. 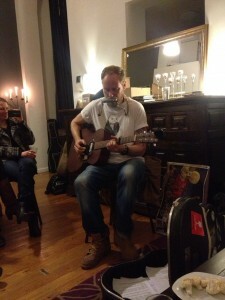 A couple of touring minor musicians were invited to play for an audience of about 30-40 people in an apartment in downtown Brussels. It was difficult for me to find the courage to go to a party where I only knew one person and everyone was native French speakers, but I gathered together stray bits of social bravery and headed out. The home I was invited into was an elegantly decorated old studio apartment with a vaulted ceiling. All the attendees were dressed very stylishly and there were candles scattered all over the apartment. When it comes to house parties, apparently the same drinking sensibilities reign no matter the country. The kitchen was stocked with rum and coke, vodka and orange juice and a local cheap beer that I thought tasted like a light pilsner. It really was the belgian equivalent of Bud Light! I guess some things never change no matter where you are. The second artist was a man from the UK (ttp://www.davidphilips.net/). David Philips surprised me by following up the delicate Sara Carlier with some modern rock/blues with a touch of country. These are very US styles so it felt odd to hear them in a Belgian living room. I even got to speak English with him between acts. It was surprisingly refreshing to be able to speak English at a quick pace with a native speaker. It made me realize that was the first time I had been able to do that since I arrive two weeks ago. I was at first very nervous about being around so many French speakers chatting around me in rapid French that I could not follow, but eventually after a drink and spending some time there I found some very nice people that spoke to me in English. We shared some fun stories about work and travel and I enjoyed myself. I finished out my weekend by trying to do some laundry and going to the supermarket. The store I found on Anspach the other day is actually open on Sundays and is quite large despite being cramped. I was happy to stock up on cereal meat and cheese. The laundry was less successful, I found out the washing machine is front loader and I had bought regular detergent. After I bought a front loader liquid replacement, I found out that ALL Belgian washing machines are font load. So now I have two sets of detergent for my four month stay. I suppose I’ll never run out. Sunday also afforded me the chance to spend some time hanging out with Rob on Skype, which was a weekend highlight that left me feeling like my weekend was successful. Chimay Blanche – Delicious and unfiltered goodness. Juniper – Cheap pilsner. Sort of nostalgic as it tastes like a strong Bud Light. The last few days have been busy. Driving in Belgium isn’t awful; I generally know what I’m doing. I’ve gotten used to all the roundabouts, and they’re actually starting to grow on me. The speeds are in kph instead on mph, but cars give you a kph reading so it isn’t hard to adjust. There is absolutely NOT right turn on red. Try that move here and you’ll get into piles of trouble. The trickiest part of being an American driving in Belgium is the concept of priority on the right. Now in the US, we give the right away to right at stop signs and some other intersections, but the Belgians take this to another level. There are almost no stop signs anywhere, and at all unmarked intersections, you just have to expect to give anyone approaching from the right the right of way. This is true even for intersections where that seems unlikely, where the road on the right doesn’t intuitively seem like it should have priority over yours based on the relative size or traffic of each road. I still find some intersections confusing, but my method is to just not hit anyone and I suppose I’ll be okay. My daily drive begins by jogging through small streets in the city trying to get to the outer ring of highways that loop around Brussels. The Ring then takes me around Brussels to where I work in the south. I could switch back to the train commute, but right now I’m comfortable driving, how very American of me. I hope to exchange large car soon for a smaller one. Pulling into my garage is nerve wracking because of the tight squeeze. The strangest sight on my drive is what looks like a large nuclear reactor steam vent. It’s one the really traditionally shaped ones, like you see on the Simpsons. Belgium has taken the initiative of spicing up the tower a bit. When I drive by, the vent is lit up with a colorful and lively display. It looks like a work of art. I am unable to stop and take a photo while driving at 120 kph on the ring. I’d really like to get a photo, but I’ll have to wait until I have a driving companion to get one. Today the tower’s light show was pink and white hearts (it’s an active show not just passive lights). I suppose the nuclear power plant wants to celebrate Valentine’s Day just like the rest of us. Another trial I should mention is the saga of trying to retrieve my Declaration of Arrive at Brussels town hall. 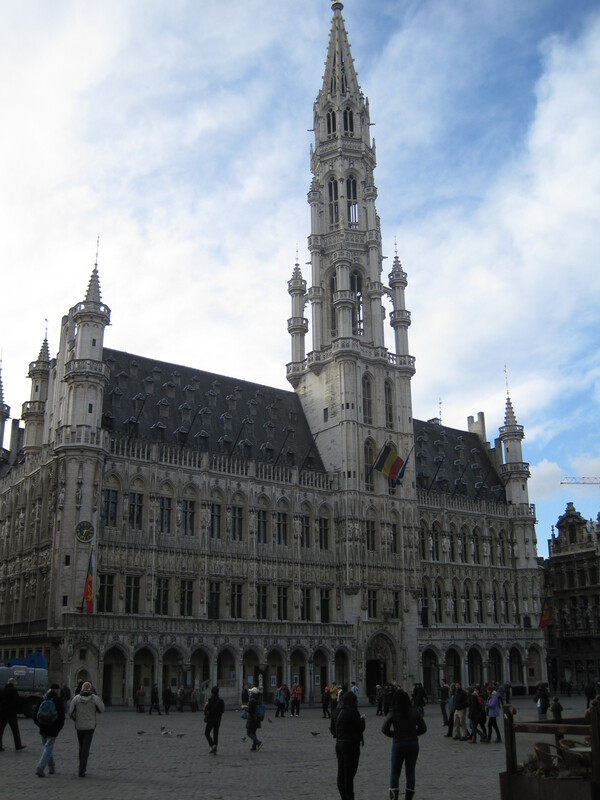 The premise is, I have to go to the town hall within eight days of me arrival in Belgium to retrieve paperwork that verifies that I am living in Belgium at the address I gave when I entered. Apparently this regulation is new, and the local authorities have not staffed or organized appropriately for the major influx of new residents that need these declarations. I tried to stop in on Monday, and it turned out that even though it was 3 hours before close, they were not accepting additional people into the queue. Given that I am at the end of my grace period, I attempted to go in again today. After an excruciatingly long ~3 hour wait, I finally made it to the counter. After a rough franglais conversation with the attendant, I learned that that was just the line to MAKE AN APPOINTMENT to get my declaration of arrival. I have to go back again next Monday (three business days from now). Given that this is a time sensitive document, I hope that the authorities are flexible given how difficult this documentation is to obtain. Anywhoo, I’ll be back for a third time on Monday, I hope it’s my last visit. One very nice thing about these trips to town hall is that walking there brought me through a new part of Brussels. The street it is located on actually has a supermarket, not just a convenience store. 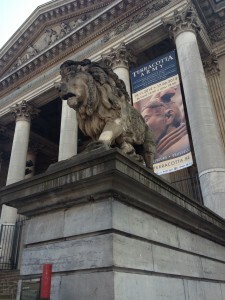 I passed a gorgeous museum with pillars and stone lions. The signage claims that they are currently housing some of the Chinese terracotta army. I need to investigate when a good time to visit would be. I also found a Mobistar (one of Belgium’s three major cell carriers). I FINALLY have a cellular plan that I am happy with. I will get 2GB, 1000 texts and some 100 odd minutes a month for 15 euro ($20). I’m not sure what it costs to send text messages to Belgium, but friends you’d be better off using my Google voice number which I’ve set up on my phone. Message me if you want this number. Beer: La Trappist Tripel – This beer is absolutely delicious and has all the delightful flavors one should expect from a tripel. This is a particular favorite! I’ve enjoyed my weekend immensely. I got home way too late on Friday do to much. Everything in the city center is closed after 7pm except some restaurants. Even the convenience store I tried to stop at was closed. A Steam sale and a suggestion from Rob prompted us to both buy Boarderlands 2. Everyone I’ve talked to as well as reviewers seem to like the game. Given the game’s 5.1 GB download, I wasn’t able to start playing until Saturday morning. I was able to try out the Siren and the Assassin class types. Though I’m not wild about the female Siren’s skill set, I can’t stand having Zero as an avatar. I find it annoying that the supposedly tough female character is the mage/support class. Why do women always get stuck with the support skills? It looks like we haven’t come far since Secret of Mana. Despite my conflicting avatar/skill set dilemma, I’ve been enjoyed the game both alone and cooperatively. Turns out, I find sniping the most entertaining, well that and setting my enemies of fire with the elemental guns available in the game. Headshots are almost imaba, it’s hard to justify play style that doesn’t focus on sniping/headshots, although that could be partially personal preference. After spending most of Saturday playing games with my boyfriend, friends and brother, I was ready for an adventure on Sunday. 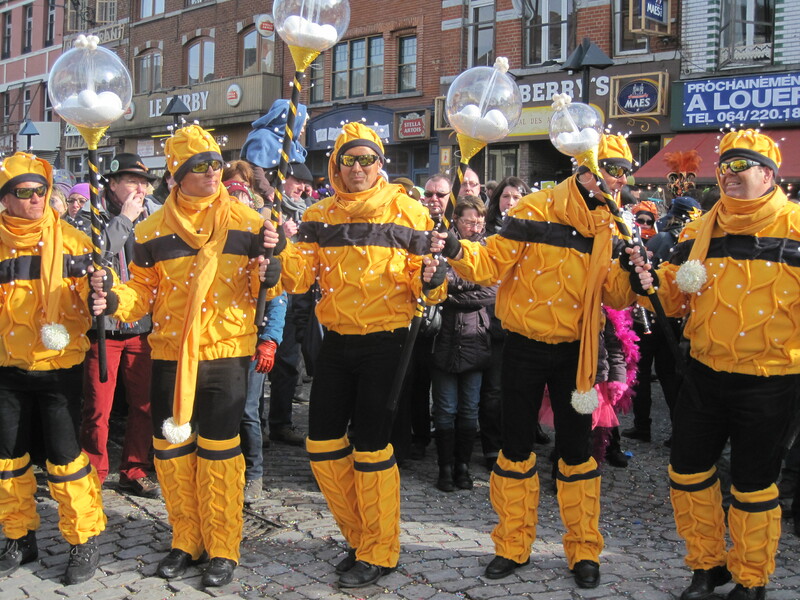 A coworker and I attended day 1 of the three day festival called Gilles de Binche. 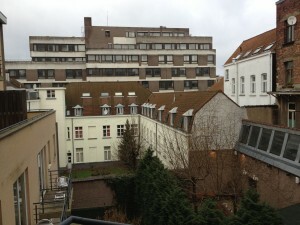 Binche is the name of a City about 45 minutes drive from Brussels center and Gilles are. . . well Gilles. I’m not sure I can even come up with a US equivalent. I should note that I really did not wear clothing warm enough for the ~28F day. Though I had fun, I was constantly trying to warm up numb fingers and toes. I have no idea what they were going for. Gilles are exclusively men and boys from the small town of Binche. I thought at first that they would be street performers, but in truth, they are revelers who entertain crowds by marching around town to drumbeat while waving odd sticks. Why do they wave these sticks about? Traditionally, it was to ward away evil spirits in the 14th century, but now I think it is just fun for everyone involved. People come from all over Brussels and beyond to party in Binche. The mood at the festival is extremely lighthearted, the bars were full of tipsy patrons and the streets were crowded with children and tourists there to catch the fun. 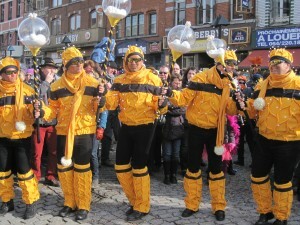 The costumes the Binches wear on Sunday of the festival are whimsical. They seemed completely random at times, and usually a large number of men (at least 5+) matched one another. 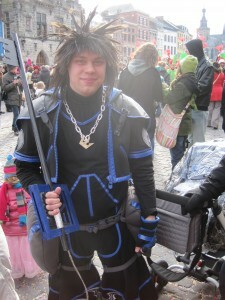 There were also a few oddballs that didn’t match anyone, like this cosplayer I caught marching around. He seemed happy enough to pose for a picture. I also took the time to enjoy the architecture of the town. 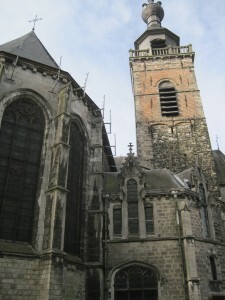 Here is a photo of the old Cathedral in Binche. Catholic churches were simply the most interesting and beautiful buildings built in the early ages of European cities, so I always find myself fascinated by them during my travels. Whew it’s late, I’ll try to check in tomorrow. Today was another first day. I went to work in a second company location where I met a whole new group of people. It ended up being very pleasant and the facility really captured my attention. In order to get there, I had to take the Brussels equivalent to the NY Subway. Here it’s affectionately called The Metro. I purchased my ticket from a real live person entirely in French. It felt like a small victory even there wasn’t a lot of dialogue. I purchased a five ride ticket and heading on down. The train itself was nice, but you have to walk through a line of beggars to get to and from your train at my local station. I’ve got no beef with the homeless, but one man aggressively ran up to me waving a small tray in my face asking loudly for money. Maybe I look like a softie? The colleagues at this work location are a lot more accustomed to using French than English. I find myself extremely thankful every day that I took so much French. I found the facility very impressive, I only got a brief tour with general explanations. Since I will return to the facility on Monday, I expect to get a lot more familiar with the technical aspects of this plant. I met a colleagues children today. I couldn’t get over how foreign I seem to them. I suppose every first time international traveler must experience this, but being a foreigner from a far away country feels so strange. I enjoy how the experience gives me some perspective about my place in the world. On the way home, I stopped by a local Sushi Shop. I was in a hurry, so I purchased a premade sushi box. It comes with bamboo chopsticks and the soy sauce comes in tiny adorable bottles. No soy sauce mess when I pour out the liquid from a stupid packet!. +1 The sushi was good enough to come back for, although some of the flavors tasted a little off, not bad, just different than what I’m used to. I think I’ll return, as it is a great place to take out. I think next time I will order my fish fresh and tolerate the wait. Beer tonight is Delirium Red. I was expecting a lambic, but instead I got a sweet cheery beer, or is it sour? I can’t tell. Either way, I think I prefer the classic Delirium Tremens. On my way back from the Sushi shop, I spied this in an antique store. 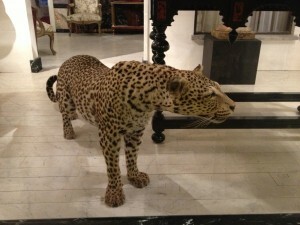 I’m pretty sure it is a real stuffed jungle cat. Today was the toughest so far. Sleep is not easy to come by due to homesickness, jet lag and an extremely irritating intermittent buzzing that comes through my bedroom wall due to some building utility I cannot identify. I estimate I may have slept three hours at best and was woken up roughly every 15 minutes due to the buzzing. It sounds a bit like the sound you hear back home when you get buzzed into an apartment, but it lasts for about 30 seconds. Despite my lack of sleep, when 6:50 rolled around I was out of bed and out the door. A dreary, cold rain greeting me upon exiting my apartment but I got to the train well in time. In fact, I was too early and had to wait quite a while for my delayed train. Once on the train, I was able to relax and enjoy a bit of the scenery from the upper level of the train. I am unsure if this is typical of Belgian trains, but the whole car was dead silent. These trains have sound dampening unheard of by Chicago’s CTA/Metra/L. 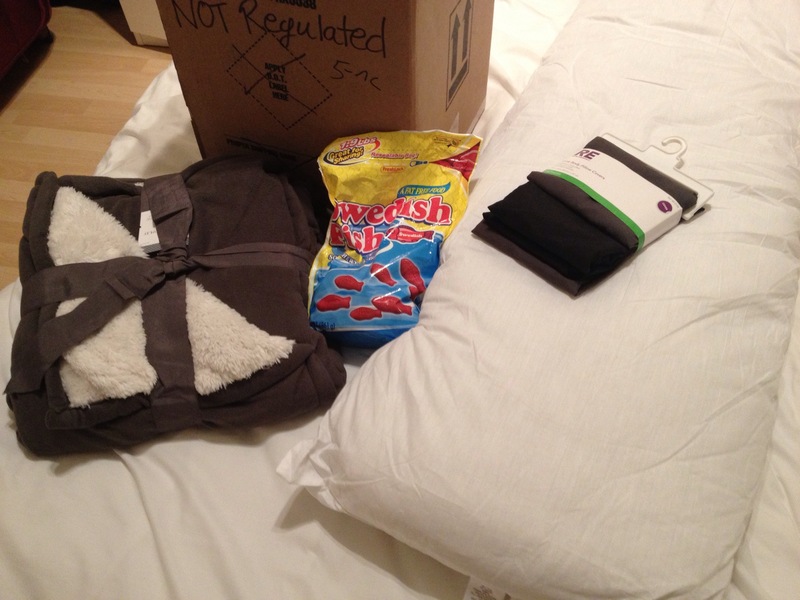 On top of that, there wasn’t so much as a peep or a rustle from any of my cabin mates. When in Rome. . . Not like I had anyone to chatter with anyway. The silence was relaxing. Once I arrived at my destination, I walked off the train into the rain, which promptly made me realize that I had forgotten my umbrella on the upper level of the train. In a dangerous split second decision, I dashed back onto the train, up the stairs and back to my seat where my umbrella was sitting. Maybe I should have just let it go, but I’m rather attached to the silly, bent up old thing. Thankfully, the train doors didn’t smash me in the face on the way out. The rain I mentioned earlier was a miserable near freezing drizzle. In fact, later in the office the rain turned to snow. It came down in beautiful billowing swirls, that drew my gaze away from my repetitive training tasks I was assigned at work. I think I will enjoy working here. My project is has captured my interest (its hard for me to find motivation to work on something I am not interested in). There is more French than I expected. Even though the work is formally in English. Most casual and even work related conversations appear to happen in French. The conversations fly by too quickly for me to pick up much more than the topic being discussed. Some basic vocabulary knowledge and inference based on nonverbal communication helps me get by. I find myself being very grateful that I took so much French in high school. I can put together a few rudimentary sentences of my own, which my colleagues seem to understand and appreciate. I will keep working on improvement in this, as I feel there is a great value in developing this skill. I had to fight for at least 20 minutes to get my GPS to target home. The interface is tremendously lousy and apparently my street doesn’t exist in it’s database! It’s true that my street tends to have 2-3 different names per city block, but I really struggled to get the GPS set (no cell phone data plan for Gmaps). The car I have been given to drive makes me uncomfortable because it is so large. I live in the heart of a city and am driving a crossover SUV and I don’t need to move anyone around but me! Parking in my tiny apartment garage nearly gave me a heart attack, as my vehicle has trouble fitting into both the garage entrance and my assigned parking space. I hope that I can replace it with a car I find more manageable. Thankfully, when I arrived home my unit has all the repairs I had asked for. My heater is actually producing heat! I have a router for the wifis! my toilet no longer runs! Hizzah! I feel guilty for not going out to find dinner on the lovely cobbled streets of Brussels, but I am wiped out after a long and stressful day. I have to be up even earlier tomorrow, and a lot of the restaurants in my area are surprisingly closed this late. I didn’t have the time to take pictures today and I didn’t really see anything interesting or beautiful except at work where I am not allowed to take pictures. I’m sorry I don’t have anything touristy to report today, so here’s a picture of the courtyard view from my apartment that I took a couple of days ago. After a rough night’s sleep in a lovely but lonely new apartment, I awoke to a brand new day in the charming city of Brussels. I threw my curtains wide and promptly realized that my cross-courtyard neighbors can easily see into my flat. I also quickly realized that my heat isn’t working. At least the weather is milder here than in Chicago. The temperature is more like 5C (40F) rather than -5C (23F). While I await heater repairs, I’ve been bundling up in a sweatshirt (apparently blankets are not included in fully furnished apartments) and letting my laptop keep me warm while home. That being said, I haven’t spent all that much time at home. A kind colleague (Eveline) greeted me this morning with a lovely gift basket full of Belgian goodies, including chocolate, sweets and a Lambic (Sour fruity beer that Belgian is famous for brewing). I’ve also acquired a few other gems that I am looking forward to trying. Believe me it wasn’t easy. I’m not sure how many of my readers (all ten of you) have ever grocery shopped in a foreign market where you don’t speak the language, but was I ever in over my head. I am thankful Eveline saved me from forgetting to preweigh my produce prior to arriving at the checkout counter and explaining to me why the milk is stored and sold at room temperature. My high school French class prepared me for identifying farm animals and buying a movie ticket at the theater, I was not prepared to decipher the different types of butter and eggs presented to Belgian consumers at the local Carrefour supermarket (I’d compare it to a Super Target). I DID learn that Duvel, Chimay, Hoegarden and Leffe (pronounced LEF my American friends) are grocery store staples that you can find at nearly every convenience store. I picked up a small variety of Belgian beers that were sold for around 1 Euro a piece. I don’t always drink beer, but when I do, I prefer that it be damn good. After my harrowing adventures at the grocers, I found the time to visit some of Brussels old areas that are full of old gorgeous architecture and narrow cobbled streets. 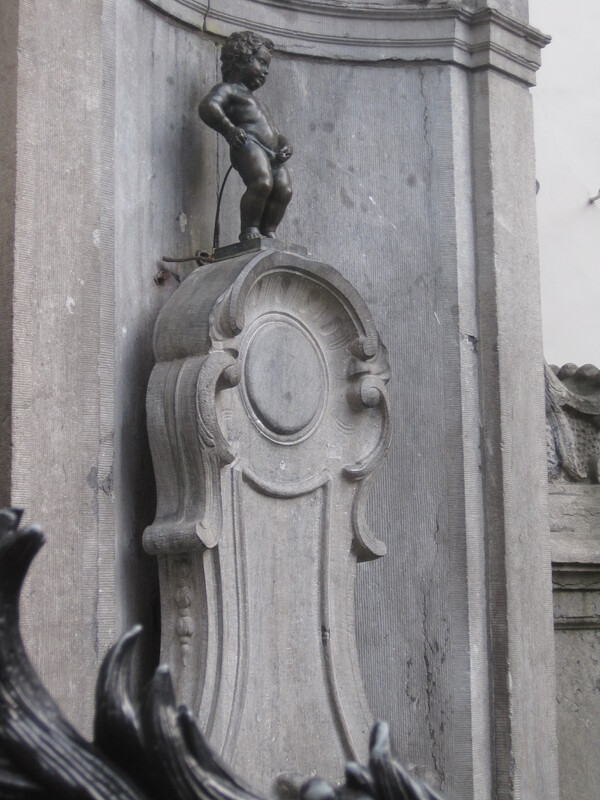 I even saw a statue of a peeing boy, which everyone assures me is very famous. It is truly called Manneken Pis. At the very least, there was a gaggle of tourists snapping photos of it, so I went ahead and grabbed one too, enjoy! All this wandering around left me hungry, and I did indulge in a street waffle. Yes, this waffle happened to be covered in strawberries and Nutella and yes, it happened to be delicious. I discovered the train station that I will go to tomorrow to get to work, I even bought my ticket and picked my train in advance to avoid a busy foreign language confusion in the morning. 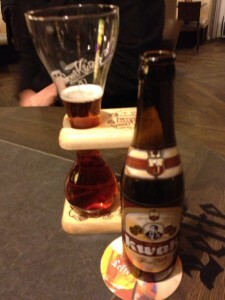 After a hard day turisting, I enjoyed a hearty dinner of chicken nuggets and Kwak. I should eat better tomorrow, Belgium isn’t short on good food. Wish me luck at my first day of work! drums while eating a dry roll and munching down on barbecue chicken. The vegetables it was served with we’re mushy, but the rice was tasty. how different my meal would taste while on the ground. 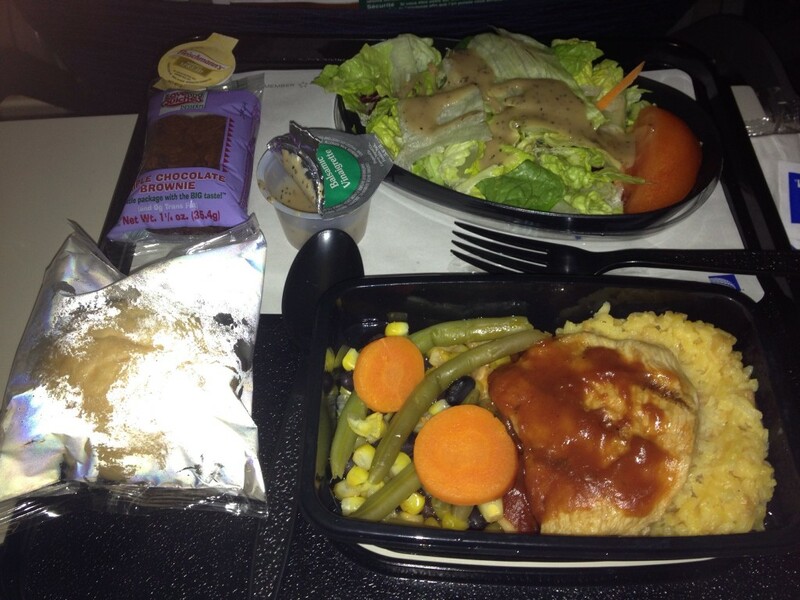 served before landing. Brownie, I have one word for you; SOON. . .